Info "Complete the word by switching the letters around!" Alphabet Soup is one of Orbulon's microgames in WarioWare: Twisted! 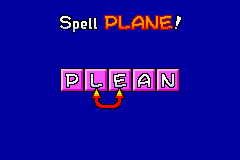 The game's purpose is to switch between the letters to make a complete correct word. This page was last edited on December 16, 2018, at 11:23.